Maintaining any kind of blog is cumbersome. A travel one at that, even more so. One, the job world robs you of (m)any such traveling chances, two the lethargy that sets in after a rare travel or two kills the rest of the scribbling mood. 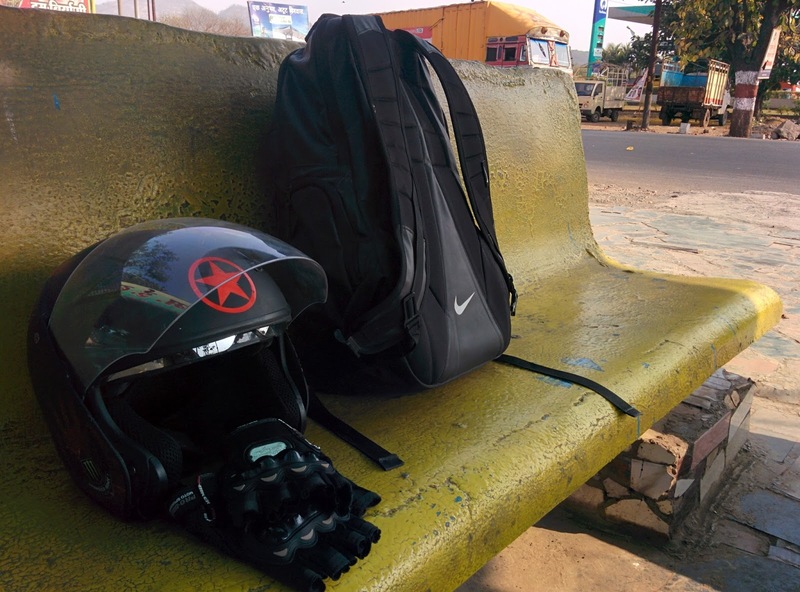 Anyway, beating all that and a hiatus that has seemed to have spanned a couple of centuries, here we are - aS travel tales are back, with an additional flavor of motorcycle grease (I know. Bad pun; in my defense, didn't i say I was on a hiatus?). 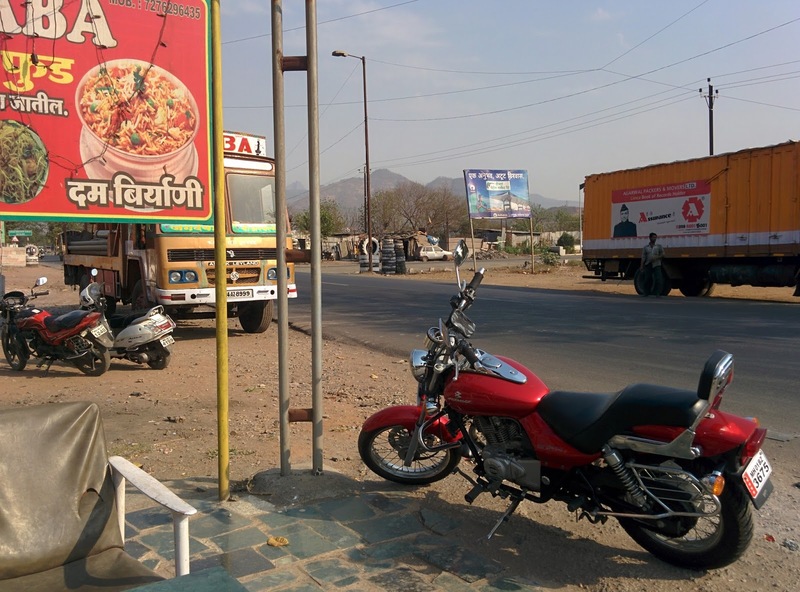 And so I re-start with my recent joyride from Mumbai to Pune on my Faisalwa- Bajaj 220 Avenger. So many reviews on the internet about biking route maps from Mumbai to Pune and all too confusing! 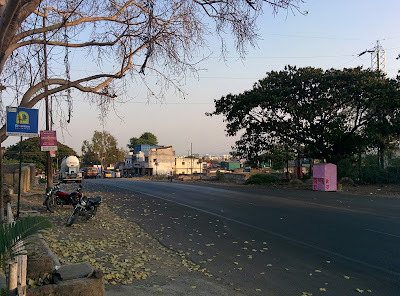 I remember having thought of taking my bike along for a spin whenever I went to Pune in the last year, and that has been like at least 7-8 times. Each time I would read some 4-5 reviews, contemplate the pros and cons of a bike ride on highways and end up taking one of those "cool cabs". All the blogs talked about how you have to make sure you never touch the Mumbai Pune Expressway, how you would anyways touch the Mumbai Pune Expressway, how you would have to have a good eye on the signboards how you should never assume and how you could be fined by the cops for riding a two wheeler where it ain't allowed. And of course there is worse. I don't think travelogues should discourage travelers. And one fine day (Gudi Padwa I guess), I had had enough! I just took my riding gloves, my helmet, my keys and hit the road on Faisalwa. Simple as that! Let's tackle one signal at a a time, let's tackle one sign-board at a time, like the Kapur son had said recently to his father. I understand pro-bikers will remark that Mumbai-Pune bike trip is no big deal; the thing to remember here is, I have never rode for more than 30 km at a stretch, and we are talking about some 155 odd kilometers. One thing I really like about Maharashtra in general and Mumbai in particular is that there is always a sort of discipline in everything they do. There is always a rule for everybody to follow. And if you find yourself walking in the wrong 'lane' on the pedestrian part of an overbridge, you'd often hear "Mumbai mein naya aaela hai kya?" Anyway, the rule of the game here is, there is a route parallel to the much hallowed Mumbai Pune Expressway, partly formed by the NH4 and Old Mumbai Pune Highway and partly by other side-roads. It's a biker's delight. The heavy vehicles (also, most cars) would never tread this route (for it's longer) and the bikers would stay away from the expressway for obvious and legal reasons. TL;DR? Zoom this pic and ride off. 2. 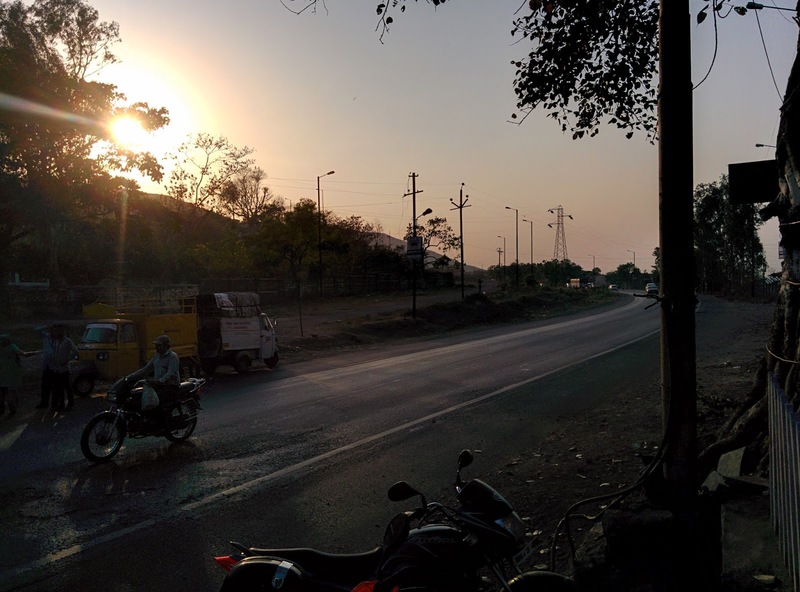 From Panvel Naka to Lonavala: Stick to NH4 like it's your long lost love. It will take you home. Well, almost! When you reach Lonavala, you'd suddenly be betrayed by her and would find yourself driving right on the cruel expressway! Ignore the infidelity and drive on for 6-7 kms (highlighted in yellow on the map above). Take the Lonavala exit ramp and hug the AH47 now. She's a beauty with her curves. She's amazing. 3. Lonavala to Pune: Keep hugging AH47 and pass through Vadgaon. I had tea there. Bad tea. You may choose to move on. You'll reach Dehu Road. A tea here, maybe? 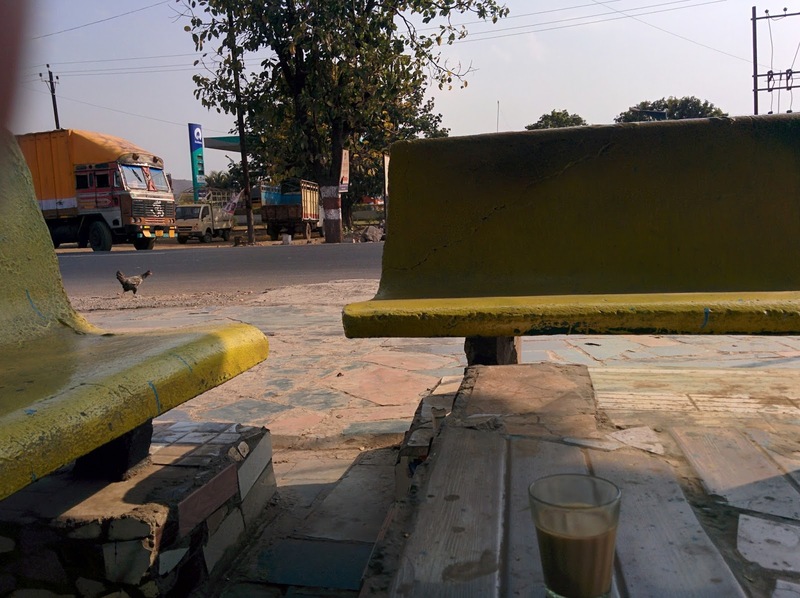 What's riding without those recurrent tea-breaks? Thank God those Tapris littered around, almost everywhere. Now where you ask? Well, keep pressing the accelerator and you'd cross Pimpri Chinchwad and then the old Mumbai Pune Highway will do the rest. The Five Pointed star just doing it. "Aaja Shaam hone aayi" "Oh no!" In sharp contrast to Mumbai Pune Expressway. Nice blog. Except for the fact that the link you provided for Google Maps is utterly misleading. Instead of taking you through Khopoli, it takes you directly through Khalapur toll plaza. Since I know the path and your picture of the map confirms the same, it is not a problem for me. However, please update / remove the link to avoid misleading other riders. The link is updated bro, thanks for the feedback! Keep coming to blog, loved the fact you liked it! Yes Arun, It's very much updated. Do use the link to get directions. Keep a good eye on the road and happy riding! a short way were old mumbai pune highway and pune exp highway meets is bike allowed on that road? a group of 5 of us are riding from New Delhi to Goa and we are doing the Daman - Pune sector on 14th Feb. I heard that mobikes are not allowed on the Mumbai-Pune expressway. Can we use your updated route ? Yes, you can drive your bike in that short portion of Mumbai Pune Expressway. But be sure to take the Lonavala exit ramp. Yes, Mobikes are not allowed on Mumbai Pune Expressway. You can totally take the route I mentioned on your mobikes- between Mumbai and Goa. It is allowed. However, make sure you are only on the Mumbai Pune expressway between Khopoli and Lonavala. It is not allowed anywhere else. Cheers guys - have a lovely ride from Delhi to Goa! I envy you all! Thanks for share details how to reach mumbai to pune via road. it's very helpfull blog. I think you can follow the above route till Khalapur, take left exit and then again a left towards Dahivati and you should reach Imagica easily. Do keep a good eye on road though. Google maps is pretty easy to follow from Khalapur exit to Imagica. Cheers! trip from mumbai to Pune ? And when? Please advise me so I ll join you as bcz this is my first trip on bike through this route. The way I see it, there is no easy alternate way, without landing on the expressway. I mean, you could go through the villages around Lonavala, but it's tricky and not really worth it. In my blog above, you can see that the expressway we need to cross is for a short distance and if you stick to your left, it is easy peasy! Happy riding and be safe. Enjoy your Sunday ride. Do let us know how was it! Thanks for your wishes. It's ok, if I need to drive for short period in expressway. I was just looking if you can provide me the alternate link from Pune to Mumbai. If I am changing the destination, the map is changing. Could you help me and provide me the link... So that I can drive easily. It's a google maps link, you can try changing intermittent places to pass through and the route will change accordingly. Yes, it's mostly the same route for Pune to Mumbai. You will have to reach expressway, but be sure to take the Khopoli exit. You will not be required to pay the penalty. The link works in reverse. As I said, keep an eye on an exit on the left once you approach Khopoli. There is a big green signboard there which is pretty hard to miss. Hello bro i just wanna ask you that is there any traffic police chowki on old highway. Ia there anyone to catch while running without liscence? I had seen a few traffic police vans roaming around on the old highway too. It's always good to have the driving license with you while driving. 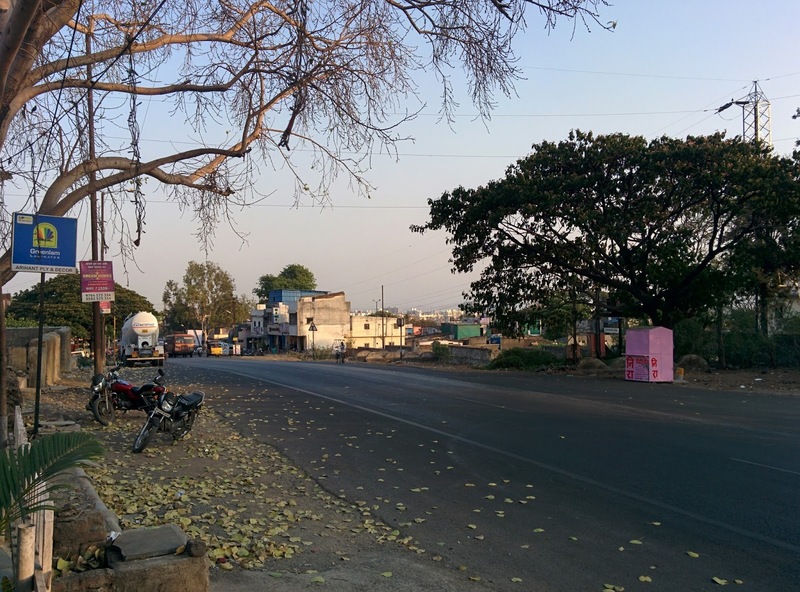 You would not want to spend your time haggling with a random traffic police guy in some random village between Mumbai and Pune. Very nice blog. Searched lots of places for the map of the route from Mumbai to Lonavala vis old highway. Found it only here! My question is... Will I get stopped by a cop for taking the Expressway till the Shedung exit? Thanks. I checked your map. After kalamboli, you dont need to merge with the expressway ahead. Cops can easily stop you there and it's not safe for bikes. Better way is: After Kalamboli, you go towards MIDC, then pass through Panvel, Kolkhe, Derawali and Ajiwali and then hit Schedung (all on NH 48). 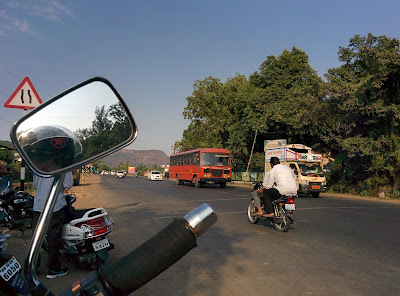 The only place on Expressway where bikes are allowed is the 6 km stretch near Lonavala. Have a safe ride! Cheers! Can we cover the Pune mumbai route on a regular Hero splendor without a lot of risk or we need a 150-200 cc bike? Hi there, I do think your site could possibly be having browser compatibility problems. Shall i just change your first and last spot? a perfect means of writing? I've a presentation subsequent week, and I'm on the search for such info.